The French Bulldog, also known as the Boule-Dogue Français, the Bouledogue Francais, the Frogdog, Bat Ears and, more affectionately, the Frenchie, is perhaps best known for its bat-like ears, miniaturized Bulldog appearance and clownish personality. The French Bulldog was recognized by the American Kennel Club in 1898 as a member of the Non-Sporting Group. The French Bulldog probably descends at least in part from the English Bulldog – likely from one of the toy varieties which were popular in England around the 1850s and 1860s, especially among lace-makers in the Nottingham region of the English midlands. Evidence suggests that from the moment the Frenchie existed as a distinct breed, it was bred almost exclusively as a human companion and watchdog. It gained its French name when the lace-makers from England moved to France, taking their miniature companions with them. The tiny Bulldogs quickly became enormously popular in France with their erect bat-like ears that mark the modern breed. The bat ears add much to the highly distinctive appearance of the French Bulldog and are a predominant breed feature today. French Bulldogs make one of the best companion dogs in the world. They are small, easy to handle and are generally well behaved around new people and other animals. Frenchies have a reputation for being mischievous and clownish, stealing attention whenever and wherever possible. This little dog adores people and craves constant attention and companionship. They don't need a lot of exercise, but love to play and at night are more than happy to curl up and relax on the sofa. French Bulldogs need a couple of 15- 30 minutes walks every day to maintain their physique, and a few sessions of playing ball to keep them entertained. Their size and activity requirements make them good apartment dogs, but they are just as happy in a big home or on a farm with lots of wide open space. Frenchies don't care so much about the size of their home, as they do the size of their owners heart. French Bulldogs should not be exercised too hard in the summer months, as they are prone to heatstroke. Swimming pool owners should be alert – this breed cannot swim and falling into a pool could be life-threatening to a Frenchie. French Bulldogs can be a training challenge. They are stubborn and quickly lose interest in repetitive activities. It is always recommended to teach your dog that you are the boss while he is young, it is harder to correct bad behavior when they are older. Training is recommended and should be conducted in short sessions, and the routine should be mixed up to keep the Frenchie's interest. French Bulldogs are small and sturdy dogs with large, bat-like ears. Their heads are flat but are not nearly as large as the head of an English Bulldog, and the forehead is rounded. They have soft, loose skin which makes petting a Frenchie an irresistible proposition. They are square in shape, with the height at the withers being approximately the same length as the withers to the tail. Though they are square, they are a bit pear shaped – wider at the shoulders than at the rear end. French Bulldogs are small, standing approximately 12 inches at the shoulder and weighing in between 22-28 pounds. French Bulldogs sport a short, shiny, smooth coat. They have loose, wrinkled skin at the head and shoulders. 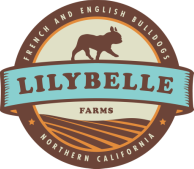 Frenchies come in a wide variety of colors including fawn, cream, brindle, blue, blue fawn, chocolate, chocolate fawn, lilac, lilac fawn, merle, black, blue and tan, chocolate and tan, lilac and tan, pied. In the show ring, not all colors are acceptable however, none of these colors disqualify a Frenchie from being a champion companion dog. French Bulldogs are easy to groom at home, as they don't require clipping of the coat. Brush weekly to keep the moderately-shedding coat looking shiny and healthy. As a puppy, it is important to handle the Frenchie's feet as often as possible. If the dog does not like to have his feet handled, this can require trips to the vet's office on a regular basis. They only need to be bathed as needed, and most owners can do this in the kitchen sink or a bathtub, with little fuss from the dog. Clean the dog's ears on a regular basis with a damp, warm cloth.